On this Presidents’ Day, we are mourning the death of Antonin Scalia, our second-greatest Supreme Court Justice ever. The reasons for Scalia’s greatness can be boiled down to a) his rhetorical approach, and b) his interpretational philosophy, called originalism; but of course, his rhetoric would never have mattered without the philosophy. and isn’t Strict Constructivism either. …well, I’d say you have some reading to do. Are you reading today about whether Obama can make a recess appointment? About which cases Scalia won or lost? About how to judge his use of fiery rhetoric? Stop reading those sorts of pieces, and first turn to the best short introduction to Scalia’s understanding of originalism that I know of, “Constitutional Interpretation the Old-Fashioned Way,” a talk from the Justice himself. It’s only about five pages, and is also one of the most delightfully humor-studded documents in American history. 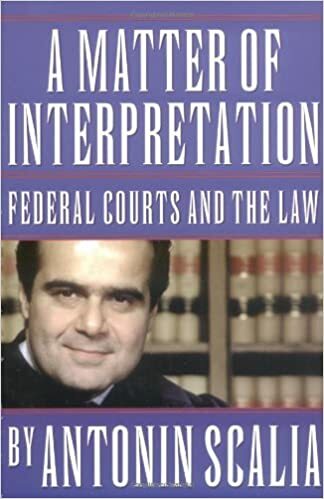 If you want something more developed and formal, that talk boils down some of the arguments Scalia makes in the lead essay in this book, A Matter of Interpretation: Federal Courts and the Law. …this is what I will conclude with although it is not on a happy note. The worst thing about the Living Constitution is that it will destroy the Constitution.